Billions of dollars in foreign capital are about to pour into Chinese companies. Some of those funds will eventually make their way to the Chinese Communist Party (CCP), its security apparatus, and its military apparatus. Global index provider MSCI recently announced that it would increase the allocation of China A-shares in its global and emerging markets indices by the end of 2019. That means many passive funds and exchange-traded funds will be set to purchase swaths of China A-shares in 2019, flooding Chinese companies and stock markets with foreign capital. One such company that will enjoy an expanded ownership base is Hangzhou Hikvision Digital Technology Co., the world’s biggest maker of surveillance equipment. The Shenzhen Stock Exchange-listed Hikvision makes surveillance technology used in concentration camps in the northwestern region of Xinjiang, where more than 1 million oppressed Muslims, according to the UN and U.S. State Department, are said to be detained by the Chinese state. Several major institutional investors already own substantial shares in Hikvision. The California State Teachers’ Retirement System (CalSTRS), the nation’s second-largest pension fund with $227 billion of assets, owned 4.4 million shares worth $24.4 million as of its June 30, 2018 disclosure of its assets. Caisse de Dépôt et Placement du Québec (CDPQ), the investment firm that manages several public pension plans of the Canadian province of Quebec totaling approximately $232 billion of assets as of Dec. 31, 2018, disclosed that it owned $81 million worth of Hikvision shares as of Dec. 31, 2017. 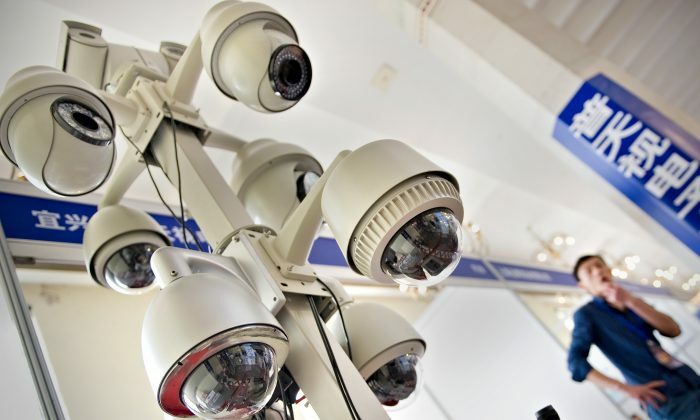 Hikvision, which grew out of a government research lab in 2001, is a major supplier to numerous state-sponsored surveillance projects across China, including the national Skynet Project. Six years ago, the company expanded into the retail and home market, by launching a line of video surveillance equipment under the brand EZVIZ. Hikvision’s biggest single shareholder, at 42 percent, is state-owned China Electronics Technology Group Corp. China Electronics Technology develops communications and electronic technology for the Chinese military and is tasked with developing software for visual identification, and was recently included in a list of Chinese entities subject to U.S. export controls due to its “significant risk” to U.S. national security. Ownership in Chinese companies with extensive links to the CCP is apparently prevalent across U.S. pension funds. The New York State Teachers’ Retirement System (NYTRS)—one of the biggest pension funds in the United States with $120 billion of assets—holds approximately $4 million worth of shares in China Unicom Hong Kong Ltd, as of Dec. 31, 2018, according to a fund statement. China Unicom is a state-owned telecommunications operator in China, providing landline and mobile communication network. Subsidiaries of China Unicom are also publicly listed on the exchanges of Hong Kong and Shanghai. China Unicom provides internet connection in North Korea, providing critical infrastructure and equipment for the Communist state and its ability to stage international cyber attacks against other nations. There’s also evidence from security researchers that several long-running hacker groups are sponsored by the Chinese state intelligence apparatus and China Unicom acting as the main internet service provider. These cyber espionage efforts were collectively nicknamed the “Winnti Umbrella” according to security experts, and have been running at least since 2009. The attacks begin with a “phishing” bait, which seeks to install malware onto corporate and organizational networks to collect data. This is just the proverbial tip of the iceberg. But it’s unfortunate—to put it charitably—that certain pensions with public funding choose to financially back Chinese firms with obvious CCP ties that are clearly adversarial to the interests of the United States and Canada. In the 2017 CDPQ annual report, the word “ethics” appears 27 times throughout the document. In its introduction, CDPQ states that “being conscious of our impact and of the world that we will leave to future generations” as a fundamental value. However, financially backing a company whose chief business is aiding the persecution of millions of ethnic minorities doesn’t seem to align with those values. Similarly, NYTRS’s annual report states that it is “committed to the highest ethical standards of conduct,” as it strives to “guard the privacy of stakeholder information” and “invest ethically to maximize income and minimize risk.” Perhaps NYTRS’s diligence into China Unicom failed to uncover China Unicom’s involvement in cyber espionage that directly attacks the privacy and digital security of Americans and U.S. businesses. At the minimum, the pension funds should already know that no matter how many shares are privately owned, key decision-making and de facto control at these Chinese companies lie entirely with the CCP. And as pension funds step up their investor activism, they must take a more critical look at their international holdings. Some U.S. politicians are putting pressure on the federal government to take action. Last year, Sen. Marco Rubio (R-Fla) wrote a letter to President Donald Trump urging the administration to impose sanctions on individuals and companies involved in constructing and operating detention centers in China’s Xinjiang region. His letter, which is endorsed by senators from both political parties, mentioned Hikvision and China Dahua Technology by name. But awareness at a more micro level is still lacking. Investors should understand that every major Chinese company, especially those involved in areas that touch on key regime interests like military, security, and cyber, must answer to the CCP and to Beijing. The Party agenda and its politics are as deeply ingrained in business as profit-making. As Chinese companies begin to tap international debt and equity capital markets more broadly, investors must understand that their money is aiding and abetting the Chinese companies’ actions, and the actions of the ultimate beneficiary of such capital—the CCP. Could China Be Spending More on Stamping Out Dissent Than Funding Its Military?